I’ve shown you mine, now show me yours. 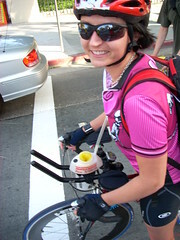 Leave a comment with a link to your bike to work day photos. More Bike To Work Day photos from Oakland, CA, Fresno, CA, the South Bay, Los Angeles, Portland, OR, Washington, D.C. and Seattle. thanks for starting the collection.